May 11, 1988, L. G. Crabo. 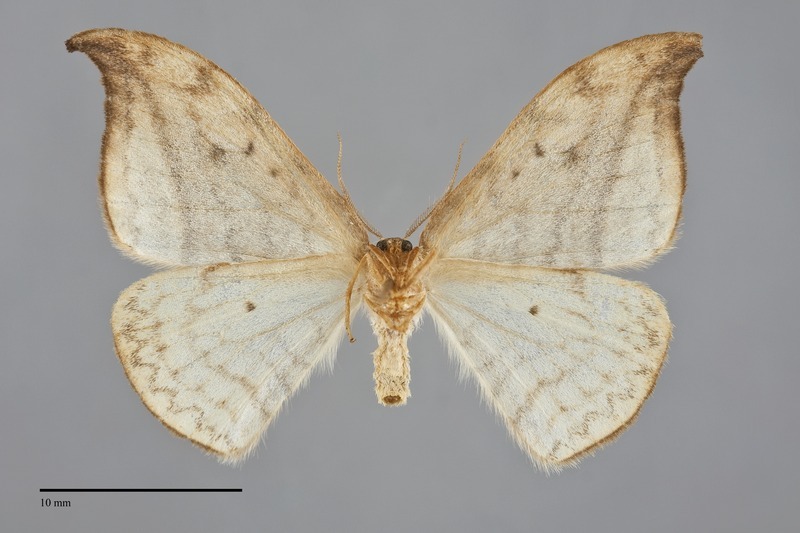 Drepana arcuata is a small to medium-sized slight-bodied moth (FW length 17–20 mm) with broad hook-tipped wings that is widely distributed in forests and flies from spring to early fall. The outer margins of both wings are smooth. The ground color is light yellow-brown to ochre, with a fine pattern of wavy brown-gray transverse lines. A strong warm-brown and black curved line extends from the distal third of the trailing margin to the apex, curving into the hook. The fringe is dark brown, black at the apex. Two gray spots mark the ends of the discal spot and a single small dot is the orbicular spot. 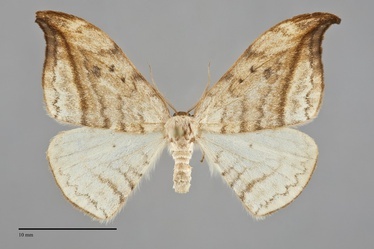 The hindwing is slightly lighter colored than the forewing. Its lines are darkest posteriorly and fade anteriorly. The hindwing discal spot is formed by two spots, one at each end of the cell. The hindwing fringe is orange-brown. The head and thorax match the forewing. The antennae of both sexes are bipectinate, more strongly in males. 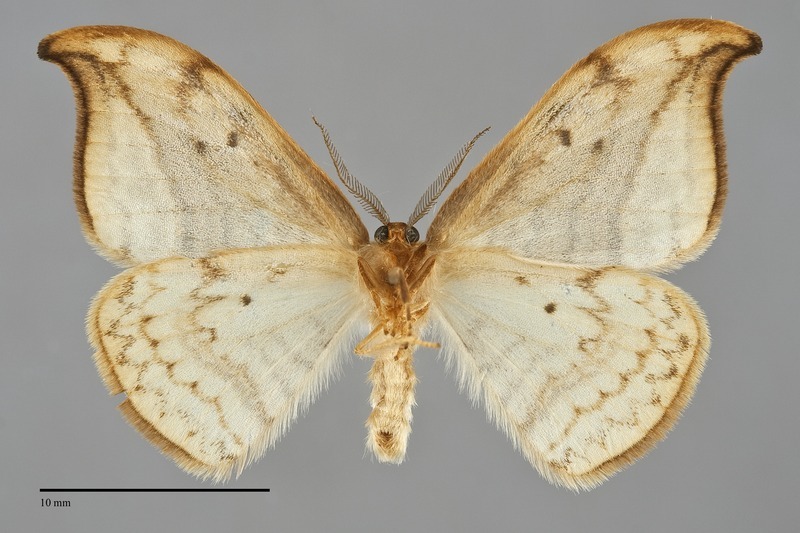 Drepana arcuata is easily recognized by its pale yellow-brown color and smooth lateral forewing margin with a strongly hooked tip. 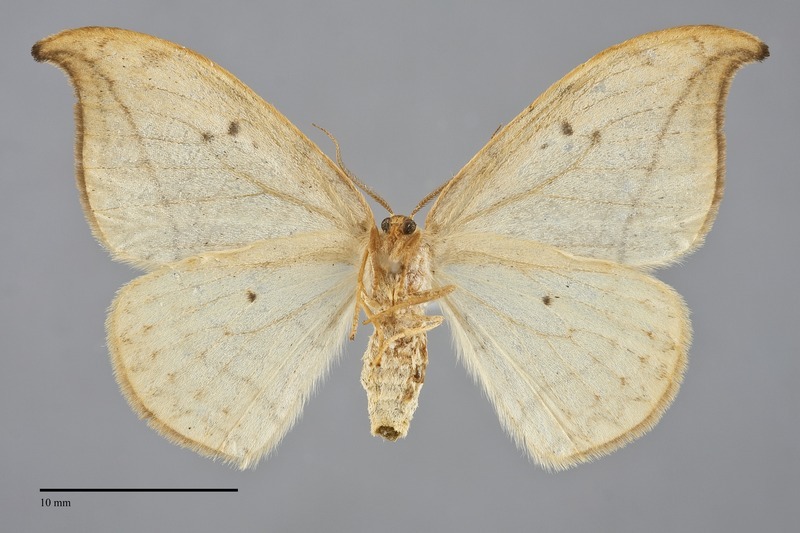 It is most similar to Drepana bilineata which differs from it in having an uneven forewing outer margin and two dark transverse lines that do not extend to the apex. 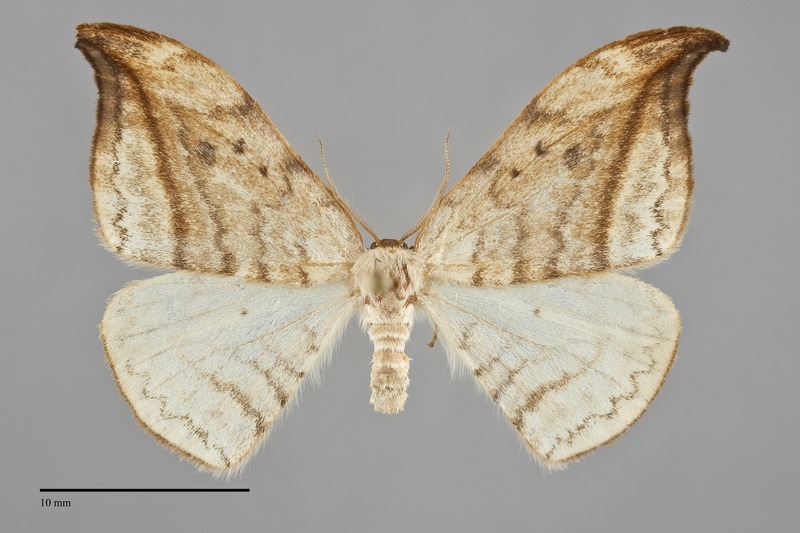 Species in the family Drepanidae resemble inchworm moths (Geometridae) in general form. The larva is mottled brown and green with knobby dorsal scoli or tubercles. It is illustrated by Miller and Hammond (2003). This species is common in a variety of low to middle-elevation forested habitats. 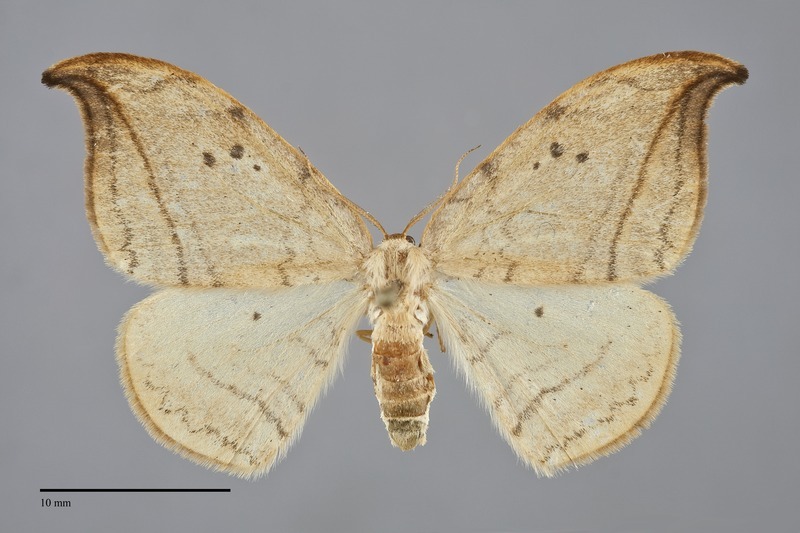 It flies in coastal rainforests of both the Coast Range and along the west slope of the Cascades. It also occurs in the Rocky Mountain region where it is more restricted to moist riparian habitats along creeks and rivers. It occurs in boreal forests throughout British Columbia. Drepana arcuata is widely distributed in the forests of the Pacific Northwest. It has been most commonly collected west of the Cascade Mountains and in southern British Columbia, but the range extends north to near the border with Yukon Territory. Most of the records from the southwestern Oregon are from the vicinity of the Pacfic Coast. The range extends south through the Idaho Panhandle to the Blue Mountains of Washington and northeastern Oregon, but D. arcuata is not found further south in either Oregon or Idaho. This species occurs in boreal forest across the North American Continent. In the East it is found as far south as South Carolina and Missouri. Its range extends south to the latitude of San Francisco Bay, both along the Pacific Coast and in the Sierra Nevada. This species is a foodplant specialist feeding on various alders (Alnus spp.) in the Betulaceae, particularly red alder (A. rubra) west of the Cascades. 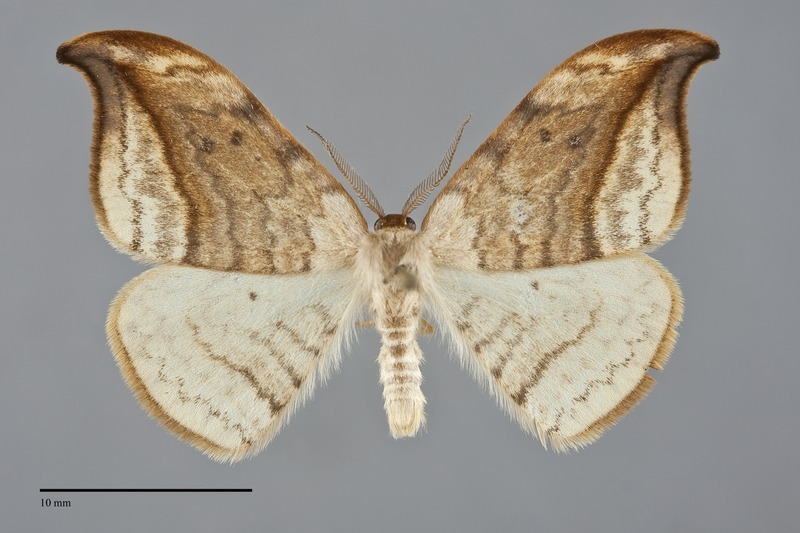 Drepana arcuata has a very long flight period from spring until fall. Most specimens have been collected from May to mid-August. It is nocturnal and comes to light.